Lisbon’s Belem is not only egg tarts and old towers. There is great new architecture happening in the area along the river Tagus. ::: tip This is Part 3 (of 3) of the Lisbon Contemporary Architecture Guide. Time to go west and enjoy the beauties of Belém. Come early and avoid the crowds at the Monastery of Jerónimos , then go eat your Pastéis de Belém in peace while the crowds arrive at the Monastery you just visited. 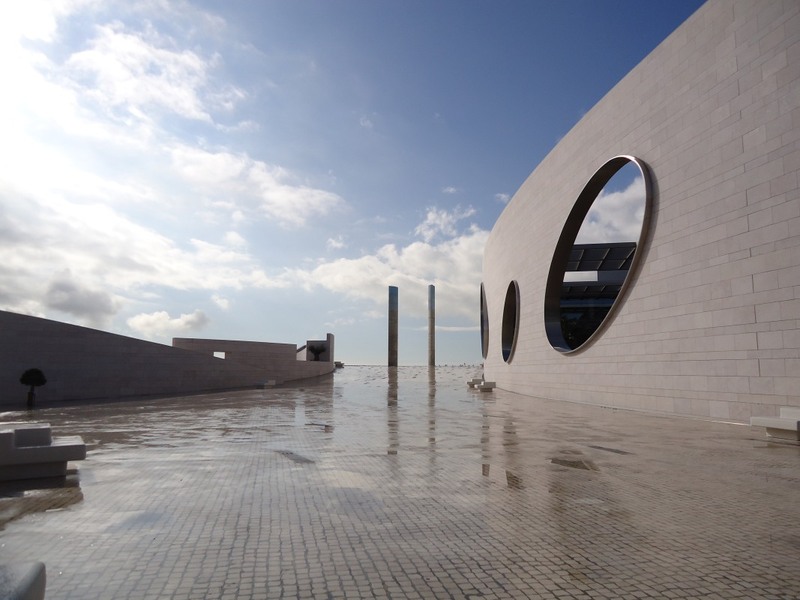 On your way to the Monument to the Discoveries , pass by the Centro Cultural de Belém to check some contemporary art. Then go check out the world famous Belém Tower and, if you are feeling like going further west, go see the Champalimaud Foundation. Otherwise, head back east along the river and drop by the National Coach Museum, from Brazilian architect Paulo Mendes da Rocha. Finish the day meeting the crowds again and basking in the afternoon sun at Amanda Levete's brand new MAAT. This huge building right next to the Monastery of Jeronimos was built to host Portugal's presidency of the European Union in 1992. It has since become the host of numerous international exhibitions (from photography to mixed-media installations), cultural events and congresses, and is also the arts complex with the city's largest auditorium. 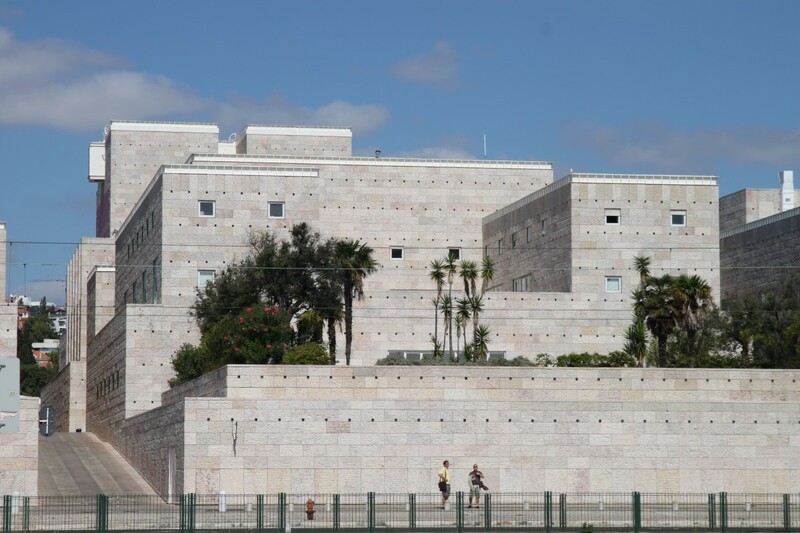 It currently houses the Berardo Museum of Modern and Contemporary Art with an incredible permanent collection and rotating exhibits. If you don’t fancy getting in, just walk around the outdoor areas and don’t miss the terrace overlooking the Monument for the Discoveries. For opening times, check the General Information page at their website. Not my favorite building on the list but deserving its place in this chapter about Belem. The Champalimaud is a medical research center designed by Charles Correa, who wrote that, despite looking like a museum of modern art, it is a medical research center that uses architecture and sculptural beauty as a form of therapy. If not for the building, go for the public space it offers. Large plazas and an open air auditorium provide much-needed rest after battling the masses at the Belem Tower. As the architect puts it, the museum does not have a door and relates to all sides; more than a museum, the project functions as an urban infrastructure offering public space to the city. The new building is composed by a central pavilion with an elevated body, and an annex, both connected by a bridge. Their position on the site creates a gate condition that leads to an internal square, to which the other historic buildings on the block turn to. The large cantilevers and the glass boxes composing the entrances and elevators give the building a lightness that is inviting. Go for the outdoor areas, check the gift shop and stay for the coaches. The Museum is composed of two buildings. The one mentioned in this article houses the permanent and temporary exhibitions, reception halls, a workshop for conservation and restoration, a gift shop, and a tourist information center. The original museum is located at the The Royal Riding School, which used to belong to the Royal Palace of Belém, currently the official residence of the President of the Republic. It can be visited as an exhibition nucleus of the National Coach Museum. For opening times and other information, take a look at the museum's Visit page . It was still a construction site when I visited, in my mind just an ugly render published long ago on the web. 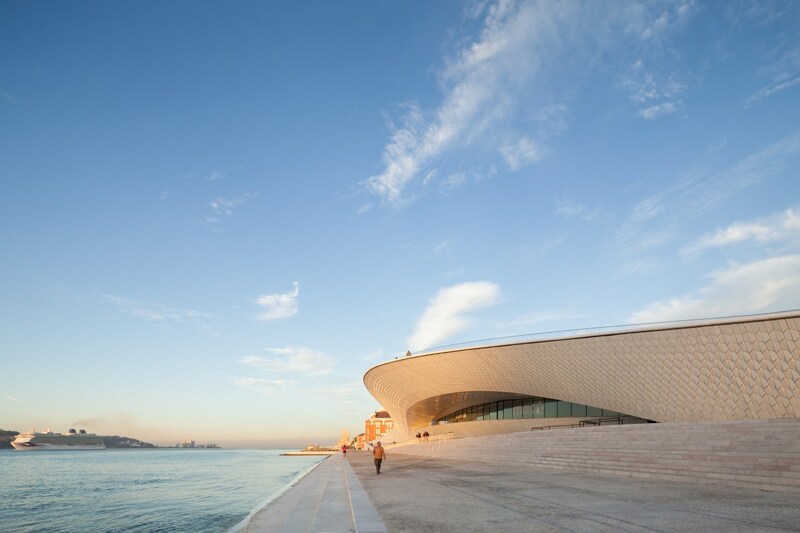 Completed this year, Amanda Levete's Museum of Art, Architecture and Technology is the latest occupant of Belem's waterfront, and it looks stunning. Its sinuous curves with its ceramic tiled facades were are hit on all design publications last year, and the site is popular also with the Portuguese people, who crowd its steps overlooking the Tagus river facing the afternoon sun. The MAAT distributed its ten exhibition spaces in two buildings: a renovated power station from the beggining of the 20th century and the new Amanda Levete building. You pay a low 5EUR admission fee and can visit all the exhibitions on both buildings. For more information about opening times and current exhibitions, visit the extensive MAAT website .